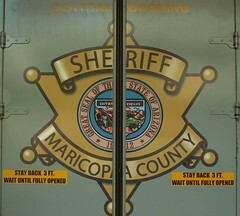 Like water off of a duck’s back; that’s how Huffington Post’s criticism of Sheriff Arpaio’s operation of the Maricopa County jail he is operating has affected the sheriff. You can read a portion of the Huffer’s post below and then follow the rest by clicking on the link shown below the partial narrative. The Huffington Post was none too pleased with Arizona’s Sheriff Joe Arpaio over his cost-cutting efforts with his county jail’s Thanksgiving Day menu.